Sybil Fay Rogers Johnson passed away Saturday, February 13, 2016, at the age of 88, following a brief illness. She had spent her adult life in the Oplin community in Callahan County and her growing up years in the Rogers Community of Taylor County. Although separated by a county line, Big Country residents will recognize that the two communities are less than 10 miles apart. Sybil was the daughter of Herbert and Lucy Johnson Rogers and was a graduate of Lawn High School. She married Tommie Johnson of Oplin in 1945 and they lived and ranched in that community their entire lives. In addition to ranching, Sybil served on the Taylor Electric Cooperative board of directors, assuming Tommie's seat after his death. In 2014, TEC held a dedication ceremony at its Denton Valley substation and renamed it the Johnson Station in honor of their combined 50 years of service to the Co-op. 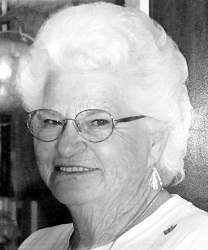 Over the years Sybil served as a 4-H adult leader, an election judge for the Oplin community, was treasurer for the Oplin Cemetery, the Callahan County Historical Society, the ASCS board in Baird, responded to calls with the Oplin Volunteer Fire Department and served on the Oplin Community Center board, including working the door for many of the dances at the Grand Ole Oplin. Sybil was preceded in death by her parents; husbands Tommie Johnson and A. E. Norris; and her sister, Mildred Eaton of Rogers. She is survived by her son and daughter-in-law, Eddie and Weegee May Johnson of Oplin; and her daughter and son-in-law, Cindy and Lloyd Harper of Fredericksburg. Her grandchildren are, Tom Edd Johnson and wife Mindy of Cottonwood, Fawn Gotcher and husband Cody of Oplin, Misty Cozart and husband Ben of Early, Lisa Odom and husband Dan of Lubbock, & Christie Harper of Enid, OK; Sybil was also Mimi to 9 great-grandchildren. In her later years, her joys were her family, her faithful dog Tucker, her cattle, the Tennis Channel, completing the daily crossword puzzle in the Abilene Reporter News, all things related to Taylor Electric Co-op, pitching washers, playing 42, occasional gambling trips to Laughlin and attending Sunday lunch with friends and family following worship at the Oplin Church of Christ. Sybil will be greatly missed by all who were lucky enough to know her as friend, relative, colleague, Mom and Mimi. Sybil's funeral service will be held at the Elliott Hamil Funeral Home, 542 Hickory Street, Abilene, on Tuesday, February 16, 2016, at 10:00 AM. Burial will follow at the Oplin Community Cemetery. The family will be visiting with friends during visitation on Monday, February 15, 2016, from 5:00 PM until 7:00 PM, at the funeral home. In lieu of flowers the family requests that donations be made to the Oplin Cemetery Fund (address) or the giver's charity of choice . There will be a fellowship meal following burial at the Oplin Community Center provided by Taylor Electric Cooperative.